The amazing mosque of Amr ibn al-As was the center of the ancient capital of Egypt “Fustat”. It was built in 641–642 AD and was considered the fourth largest mosque in the Islamic world. The mosque has been built in the previous location of the tent that belonged to the Islamic commander Amr ibn al-As. The truly astonishing part of this mosque is that one corner of this mosque contains the tomb of Amr’s son ‘Abd Allah ibn ‘Amr ibn al-‘As and it was the first mosque to be built in Africa. The sadly thing is that nothing of the original mosque remains because of the continual reconstruction of the mosque. There are two titles of the mosque which are: “The Antique Mosque” and “The Crown of the Mosques”. Who is Amr Ibn al-As? The Islamic commander Amr ibn al-As was born 585. He led the Muslim conquest in Egypt in 640, was a contemporary of Muhammed and one of El-Sahaba. He was also the one who founded the old capital of Egypt “El-Fustat” and the mosque of Amr ibn al-As. He was shrewd and belonged to the nobility of the Quraysh. He used to fight Muslims and stand with Quraysh but he saw Muslims pray, got so interested about the Islamic morals so he entered Islam, and became one of El-Sahaba. He liberated Egypt from the Romans under the order of caliph “Omar Ibn Al-Khattab Aka Al Farouk“. In 641, he wanted to conquer Alexandria, which was the capital of Egypt during the Greco-Roman period, with his army so he set a tent on the eastern side of the Nile. When he came back victorious, he found a dove laid an egg in his tent so he declared this site to be sacred and ordered to establish the new capital in that location. After that, the mosque has been built on the same location. He died in 664 AD. Amr ibn al-As Mosque was primarily built with a low shed of wood and palm leaves. It was supported on columns of palm stems, stones, and mud bricks. Its width was 17m and its length was 29m. A lot of reconstruction works have been made in the most and one of the most important about these procedures was the work of the governor Abdallah ibn Taher in the 9th century under the rule of Caliph Mamoun. He extended the area of the mosque and the mosque measured 120 m in length and 112 m in width. The mosque was ruined after the fire of Fustat at the end of the Fatimid period in 1175 AD. Salah Al-Din rebuilt the mosque and renewed it in 1179 AD but the Mamluke leaders demolished it at the end of the 18th century. The Mosque was rebuilt in 1796 AD and Mourad Bey changed the Iwan and the courtyard replacing the seven rows of columns in the qibla liwan with 6. He also changed the bays to be perpendicular to the qibla wall instead of parallel and renewed the ceiling in addition to covering the floor with mats. The mosque was restored during the reign of Khedive Abbas Helmy II in 1906 AD and as long as it has been built 600 years before the construction of Al-Azhar, it used to be an important place where lesson circles and religious lectures were held. Everything about the previous architecture & construction has been changed because of all the events that happened during different time eras. There are great alterations, additions, and modifications in the construction of the mosque. There are also restorations that have been recorded through the various periods of the Islamic era, Ayubid, Mamluke, Abbasid and Umayyad. The area of the mosque was enlarged, the roof raised, and the palm trunk columns were replaced by marble ones. Some developments have been made to this great mosque including decorating its walls, increasing the number of entrances, and adding minarets. Now, there is a traditional open court surrounded by four riwaqs and the largest one among them is the qibla riwaq. 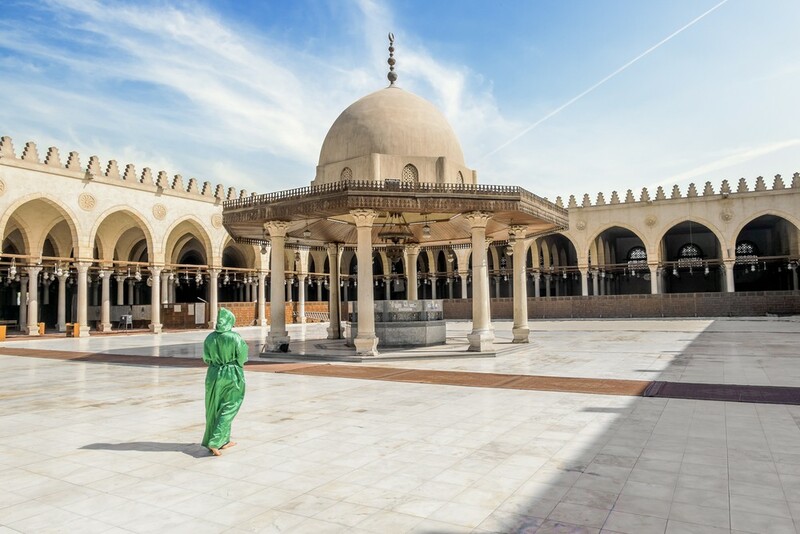 The Islamic history in Egypt has a great side to growing up the country, so there are many other Islamic attractions in Egypt you should visit, and we well created Cairo day tours for those are located in Cairo, also Egypt tour packages if you are planning a dream vacation in Egypt.